Bill Wilson Center's Adoption Program serves children of all ages in the Santa Clara County child welfare system. 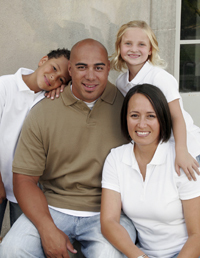 For information on becoming an Adoptive Family, please call us toll-free at 408-278-2596. In California each year, over 100,000 children are removed from their homes and placed in the child welfare system for reasons of abuse, abandonment and neglect. The goal of our adoption services program is to provide loving, permanent homes to children who have experienced varying levels of abuse and trauma that are waiting in the child welfare system. Our education and training programs ensure that adopting families have the skills, resources and confidence they need to nurture children into healthy adulthood. At this time, there are very few infants available for adoption. The majority of youth placed in adoptive families through Bill Wilson Center are age five and older. Adoption Services include an orientation, family preparation classes, and intensive skills-based training that equips parents with the tools needed to care for a range of emotional and behavioral issues. Ongoing monthly support groups and seminars on topics chosen by adoptive families are also part of Bill Wilson Center services. Additionally, private home study services are available to the community for private adoptions. You can make a profound difference by opening your home and your heart to a special child. Attend a free, no obligation Orientation at our San Jose office (please call for details). For more information or to set up a one on one meeting with an adoption coordinator, please call 408-278-2596.